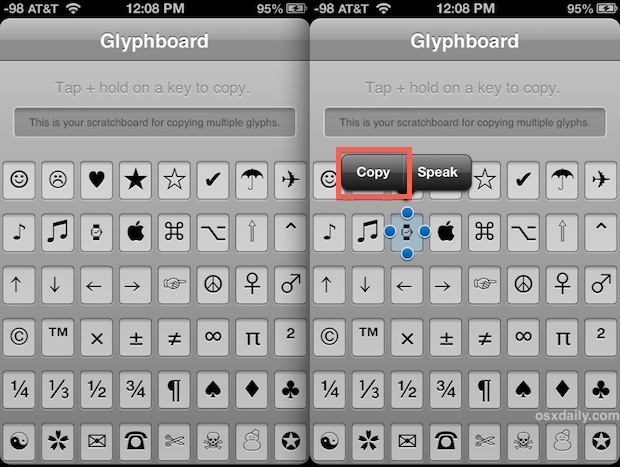 There are many extra symbols, characters, and glyphs available on iOS that are not immediately accessible, but by adding a new keyboard you can gain access to the glyphs and symbols. This includes fun ones like the  Apple logo and smiley face ☺, and though there is some similarity to emoji, these symbols and glyphs are different from the Emoji keyboard, which is also accessible to iPhone and iPad users. Additionally, a third party web-app is available that allows for quick access to a handful of special symbols through iOS as well, and we’ll show you how to use either to access and type these other characters in iOS. Some characters and glyphs are fairly buried, and others must be accessed by typing something which is then replaced by a glyph. For example, to type the  Apple logo in iOS this way, you type out “appuru” from the Japanese Kana keyboard, which is then replaced by the Apple logo. Obviously that is much more difficult then typing it on a Mac, which is just done by a keyboard combination, and hopefully future versions of iOS will make accessing and typing the special characters and glyphs easier on all native keyboards in iOS. Glyphboard makes it a lot easier to type lots of quirky characters ” ☂, ☺, ✔, ♫”, from spades, hearts, clubs, yin and yang symbols, phones, mail logos, skull and cross bones, snowmen, stars, airplanes, umbrellas, Apple logo, music notes, faces, peace symbols, and many more, they’re all laid out in a very accessible manner which takes away the guesswork that is required with the Japanese keyboard method. Even with Glyphboard on your iPhone or iPad you’ll find the total number of special characters and symbols available to iOS are limited when compared to the Mac, but that may change down the road. I was relying on copying and pasting symbols from an app (Evernote) for a long time, but I found it far too clunky so I didn’t bother most of the time. Then I thought of using keyboard shortcuts to achieve it. So for example I can now type ^2 and my iPhone or iPad will replace it with ². 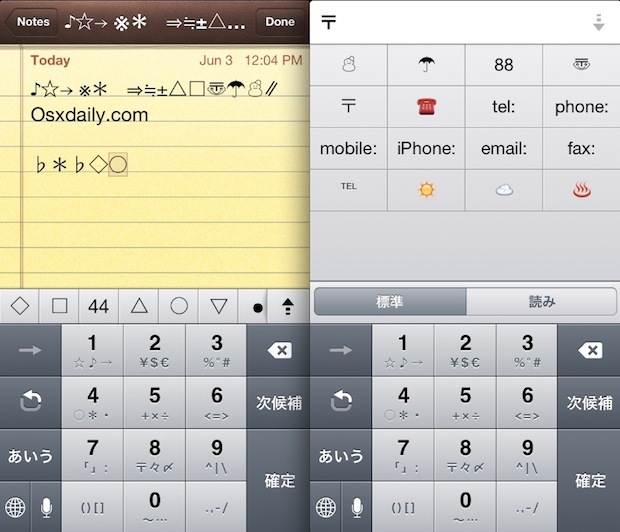 To set it up the ² symbol is copied into the “phrase” text field and “^2” is then typed into the “shortcut” text field. That and other symbols that the iPhone can handle but not type can be similarly set up for easy typing. Full details (including screencast) about how to set this up are available at my blog if you’re interested to do it: http://wp.me/p4d3tP-6y. Hey paul. Personally I’ve been trying to make my own keyboard with my own custom glyph images just like the emoji. Is there any chance I can put in my own custom glyph and make a keyboard extension for that? Alex, did you have any luck with this? I would also like to make a custom symbol library that I can use as an alternate keyboard. No text, just my custom symbols that wont exist in the existing unicode symbol base. Hey Paul, I’d like to do the same as you. Did you have any luck creating your own keyboard with custom symbols? Hey Alex, I’d like to do the same as you. Did you have any luck creating your own keyboard with custom symbols? Umm so there is a glyph that I couldn’t find. The half moon one. How do you find it? Glyohboard does not work as shown in your article. If I click and hold, it merely opens my keyboard. And the Japanese Kana does not have the character I want. I will have to email myself the characters I need then copy paste them. iOS 11.